Our next meeting will be held on Wednesday 25 September 2013 at 7.45 am for 8.00am in Alexander’s Restaurant, Best Western Scores Hotel, St Andrews. The cost of the meeting will be £10.50 per person. As usual any guest who may be thinking of joining the Club will be welcome free of charge. Our guest speakers will be Rosemary Agnew, Scottish Information Commissioner and Sarah Hutchison, Head of Policy and Information, whose talk is entitled ‘Access to Information about Public Services in Scotland’. 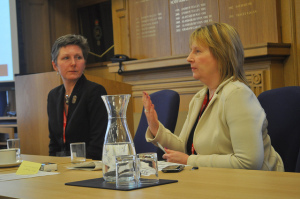 Rosemary Agnew was appointed as Scottish Information Commissioner on 1 May 2012 for a fixed term of six years. She previously held the posts of Chief Executive of the Scottish Legal Complaints Commission and Assistant Ombudsman at the Local Government Ombudsman, and so is familiar with operating within a regulatory environment. Her extensive public sector experience (which has ranged from policy and business development to complaints handling) includes managing authority compliance with freedom of information laws. She has first-hand experience of leading the development of an open culture in a Scottish public authority essential, in her view, to achieving FOI compliance. Rosemary holds a Masters in Business Administration (dist) from Manchester Business School. As Scottish Information Commissioner, Rosemary is responsible for the enforcement and promotion of Scotland’s freedom of information law. She has a keen interest in developing a framework of continuous improvement of public authority FOI practice during her term of office. She considers that the statutory obligation of FOI can also be an enabler for authorities in terms of both effectiveness and transparency: FOI is the key to many rights and freedoms in our society and also a significant driver to good public authority practice. Sarah Hutchison joined the Scottish Information Commissioner in 2003. Her role includes strategic responsibility for: improving freedom of information (FOI) practice in public authorities; promoting FOI rights to the public; influencing and supporting cultural change; developing knowledge, expertise and relationships. Sarah’s previous career includes teaching children with learning difficulties, a formative spell with Oxfam in the UK, leading equality policy in Fife Council and co-ordinating the Fife Community Plan. She holds an MA from the University of St Andrews and an MBA from Heriot Watt University.